What is so special about studying in Rome? Fr. John lectures in Hosias Loukas. The Rome Program provides multiple answers to this question. Although only a limited number of courses are offered in Rome, all of them are designed to maximize a student's understanding of the roots and development of European civilization. Some classes take place within the four walls of UD's Due Santi campus, while others are held on archaeological sites and in museums. Some classes are dedicated to an intense and intimate understanding of the Roman and Italian experience throughout the ages, while others explore a wider spectrum of themes and issues inherent to the growth and development of Western Civilization. Academic excursions, visiting lectures and two substantial group trips-one to Greece and the other through Northern Italy-round out the rich academic program on offer. Students returning from the Rome Semester typically describe their academic experiences in glowing terms. "It is the place," they say, "where UD's Core Curriculum came together for me." 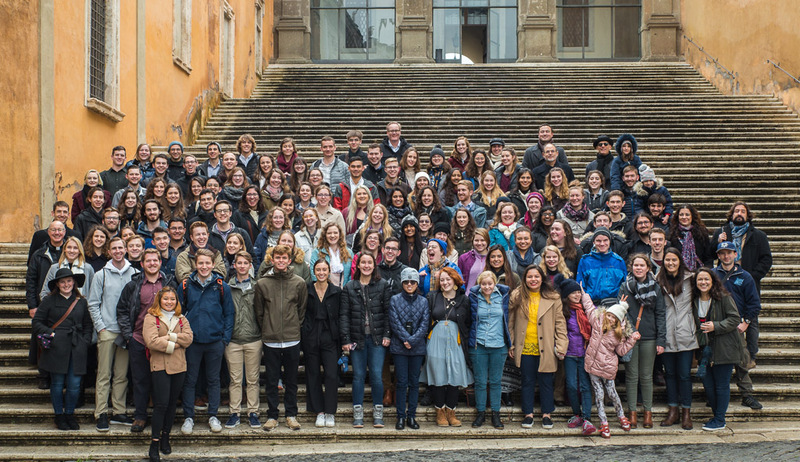 The success of the academic program in Rome comes down to two fundamental things: first, superior teaching; and second, the juxtaposition of reading great books and seeing firsthand some of the world's most historic places and most extraordinary works of art and architecture. Study Western Civilization in its epicenter. The classes on the Rome campus are designed both to fit smoothly into the program required of all students and to take full advantage of the unique setting in which they are taught. Taught primarily by University of Dallas professors, the courses are selected from those core curriculum requirements which are closely concerned with the philosophical, theological, political, literary and artistic development of Western Civilization. All Rome students are required to register for the five three-credit core courses listed below for a total of 15 credits. Students with advanced placement for English 2311 register for ENG 3355 ST/Tragedy & Comedy. Students in Rome may also register for an additional one or two one-credit pass fail options for a total of 16 or 17 credits. Since course offerings on the Rome campus are limited, freshman and sophomore year programs must be arranged carefully, saving the Rome core courses for Rome. Please be advised that taking one of the Rome courses prior to Rome may result in a student's being disqualified to attend Rome. Students requesting a waiver of these registration requirements for any reason, including planning to register for Italian in Rome, must obtain prior approval of the Dean of Constantin College. Note: Western Civilization II may be taken on the Irving campus before Western Civilization I, and Literary Tradition IV may be taken before Literary Tradition III. Class Trips. Art Course. Rome Faculty. The Greece Trip is one of the highlights of the Rome Semester. This is a ten-day trip that takes students to some of the greatest cities and the richest sites of the ancient world, including Delphi, Athens, Corinth, Mycenae, Epidaurus and Olympia. The study of Ancient Greece constitutes one of the cornerstones of UD's unique undergraduate education and Core Curriculum. UD Rome's Greece Trip in turn brings these studies to life. The Rome curriculum immerses students in the world of Ancient Greek art, literature, history and philosophy during the first weeks of the semester, prior to their study of Ancient Rome, the Middle Ages and the Renaissance. Coming in week five or six of the Rome Semester, the Greece Trip is timed to coincide with this early phase of their studies and as such it represents the culmination of every student's encounter with Ancient Greece. 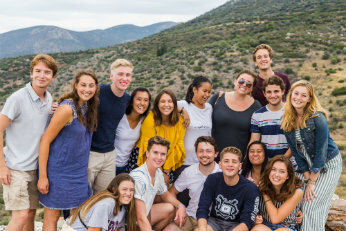 In addition to its focus on the distant past, the trip also offers participants the opportunity to become more familiar with Modern Greek culture and society through a number of scheduled music and dance events. UD professors lead the trip, offering in-depth lectures on site and organizing student performances and special cultural events along the way. Over thirty years of collective experience in Greece has made the Greece Trip a superb travel and learning experience. The Northern Italy Trip marks a significant turning point in the Rome Semester. This seven-day trip includes overnight stays in three of Europe's most historic cities--Florence, Venice and Assisi. It is scheduled during the later weeks of the semester in order to take advantage of a natural period of transition in the semester's curriculum. Ancient Greece and Rome now make room for the birth of Christianity, the Middle Ages, the Renaissance and the awakening of the modern world. The Northern Italy Trip is a perfect way to explore these periods to their very fullest. Lectures, guided walks, museum visits and generous amounts of free time for independent exploration are the keys to bringing the great historic and artistic treasures of these Medieval and Renaissance cities alive. Essentially, the Northern Italy Trip invites students to turn their full attention to the historic shift-culturally, politically and religiously-from the ancient to modern world. Unparalleled works of art and architecture from the Middle Ages and Renaissance are a mainstay of the trip. Visits to world-class museums such as the Uffizi and the Accademia of Florence or the Doges' Palace in Venice bring students into direct contact with many of the great masters of the European past. The trip also includes a visit to the Basilica of St. Francis in Assisi. Another attraction of the trip is its focus on Roman Catholic thought and the larger European intellectual tradition in which it is situated. St. Francis of Assisi and Dante hold a prominent place in that tradition, as do Machiavelli, Ficino and Leonardo. Memorials to these and other historic figures are still visible today for students intent upon returning to the roots of Europe's intellectual history. The ancients said that all roads lead to Rome and University of Dallas students are proof that the maxim holds true. Why is this the case? What is it about Rome that draws the viewer, the spectator, the student, the tourist, the expatriate, and the pilgrim? Why did the ancients believe that all thoroughfares terminated at the place where the Tiber River bends? Why did the medieval Romans believe that they lived in the Eternal City? Why did Renaissance Romans strive so valiantly to revive ancient arts and knowledge? 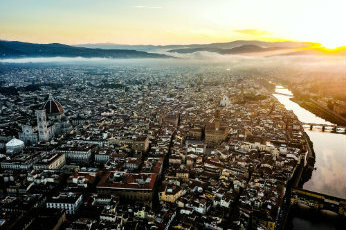 How have past and present been intricately entwined to produce one of the contemporary world's most fascinating cities? These questions are the subject of ART 2311: Art and Architecture in Rome, a course offered each semester on the University of Dallas Rome campus and designed to help students understand both the present-day city in which they spend their semester and Rome of the past. Ancient, Medieval, Renaissance, Baroque and Modern Rome are the subjects of this course. The class meets twice a week: once each week it meets in the classroom to discuss broad historical trends that provide the context for Rome's monuments of art and architecture, and once a week students go to Rome to exercise art historical methodologies in local museums, churches, and archaeological sites. Scott Crider specializes in two fields of research--both Shakespeare and Rhetoric and Composition--and has been teaching happily at the University of Dallas for well over twenty years, where he has been recognized with the Haggar Fellow and the Haggerty Teaching Excellence awards. He has published two books, The Office of Assertion and With What Persuasion, and has a third forthcoming: Aristotle's Rhetoric for Everybody. A graduate of California State University in Sacramento (a B.A. and an M.A. in English) and of the University of California at Riverside (a Ph.D. in English), he recently completed a Masters of Theology from the University of Dallas. He has directed three programs at UD--The Writing Program, the Seven Arts of Language Program, and the Graduate Program in English--and served as the Associate Dean of Constantin College. He is now studying, teaching and traveling in Rome with his wife Trang Crider, who is on leave from the Cowan-Blakley Library at UD, where she is Lead Circulation Coordinator. Valeria Cupelli comes from Rocca Priora, the highest of the Castelli Romani. In 2003 she graduated from La Sapienza University with a degree in Oriental Studies. She came back to Italy after some work experiences abroad to specialize in teaching Italian to foreigners. In 2007 she obtained the DITALS Certification (teaching Italian as a foreign language) and in 2008 she co-founded Koin, a training and language consultancy. She also works in schools on foreign students integration projects. In July 2010 she married Adriano. Dr. Dawson graduated from UD in 1986 with a B.A. in Psychology. He then went on to get an M.A. from Boston College (1991) and a Ph.D. from The Catholic University of America (2001), both in Systematic Theology. He has been teaching theology in Rome to undergraduates and postgraduates at various institutions, like the Pontifical Beda College and the Angelicum, since 2001. His interests are theological anthropology, the apophatic tradition, and the intersection between philosophical thought and the arts and liturgy. He is Associate Editor of Marriage, Families, and Spirituality for the International Academy for Marital Spirituality. Dr. Hatlie is a specialist in Late Antique, Medieval and Byzantine history. Since 1999 he has taught Ancient Greek and Western Civilization I for the Rome Program. With a B.A. in Classics from St. Olaf College and an M.A. and Ph.D. in Medieval and Byzantine History from Fordham University, he is the recipient of research awards from the American School of Classical Studies, the Fulbright-Hays Program, the Harvard University / Dumbarton Oaks Research Library and the University of Texas at Austin. His teaching interests include in history include the Ancient and Medieval Mediterranean, Medieval Church History and the social, religious and cultural history of Byzantium. He is the author of numerous articles, two brief text editions and The Monks and Monasteries of Constantinople, ca. 350-850 (Cambridge University Press, 2008). His most recent publication is the edited book, People and Places of the Roman Past: An Educated Traveler's Guide (ARC Humanities-University of Amsterdam Press, 2018). Cristina Morganti holds a BA degree in Modern Languages (1997) and Philosophy (2007) from the University of Rome at Tor Vergata. She teaches Italian as a second language in addition to working as a police woman in the city of Marino. She began work at the University of Dallas Rome Program in 2012. Dr. Robinson is a specialist in Roman archaeology, focusing on the cultural and physical landscapes of Italy in the first millennium BCE, Italian urbanism, and the nature of Roman interactions with the other inhabitants of the Italian peninsula in this period. Her current interest is in central-southern Italy. She received her B.A. in Physics with a minor in Classical Archaeology from Bowdoin College before going on to receive her M.A. and Ph.D. in Classics (Roman Archaeology) from the University of North Carolina at Chapel Hill. She has received research awards from the Fulbright Commission, the Archaeological Institute of America, the American Academy in Rome and the University of North Carolina at Chapel Hill. She has published in multiple journals and has chapters in several edited volumes. Most recently she edited Papers on Italian Urbanism in the First Millennium B.C. for the Journal of Roman Archaeology Supplementary Series (2014).